We are assuming that you do not have installed Apache2 on your system, But if you already have executed the following command to upgrade it to latest available version. Now download the mod-pagespeed module for Apache2 from official webpage, or use the following command to download it. After downloading above package install it using following command. After successful installation of the package, it will prompt for restart Apache2 service to load module in the environment. 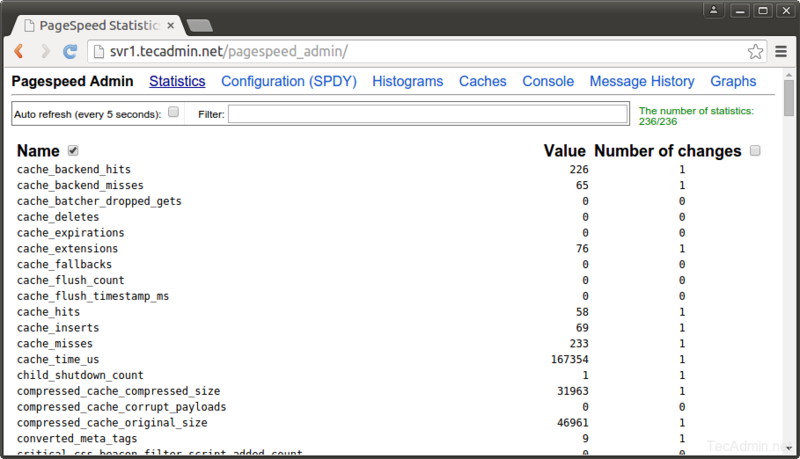 Apache Mod_Pagespeed module also provides an admin area to view statics, but default it is accessible from localhost only. To make it available from public network edit configuration file and add your IP in Allow from the list. Now access /pagespeed_admin URL in your browser, You will see the page like below.